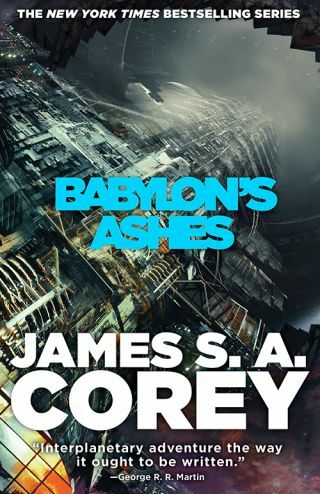 In "Babylon's Ashes" (Orbit, 2016), the people of Earth, Mars and the asteroid belt deal with the aftermath of a stunning blow from the violent Free Navy, and Capt. James Holden and the crew of the Rocinante take on a desperate mission to regain equilibrium. The new novel, releasing today (Dec. 6), is the sixth entry in James S.A. Corey's "The Expanse" series, which continues at a hard burn of one book per calendar year. Season 2 of the associated TV series on Syfy is promised for early 2017. "One of the things that we always look at when making these is ways to make them not feel like the one before," Abraham told Space.com. "What we wound up with, with 'Babylon,' was this story that was clearly a huge, sprawling story about war and the effects of war and what happens to those little families that are caught up in it. This is our 'War and Peace.'" To enhance that sprawling feeling, the authors strayed from their usual narrative process: Instead of four alternating viewpoints, two written by each author, the duo experimented with having many more character viewpoints, some of whom just come in for a chapter or two. "That's not something we've done before, and it's probably not a thing we're really likely to do again, but it was cool for this one," Abraham said. Among those viewpoints is a familiar character: Michio Pa, a member of the Outer Planets Alliance (OPA), which purports to be a government for the people of the asteroid belt. Pa features in the third book in the series, "Abaddon's Gate," as well as the novella "The Vital Abyss." But although readers have seen her before, there's never been a character viewpoint quite like hers, the authors said. "Michio Pa is a character we've never written before, unlike any character we've written before," Franck said. "I'm hoping people like her. Unlike anyone that's been a point-of-view character before, she's a hard-core OPA freedom fighter. She's a pirate. The pirates have only ever been bad guys. … And I think the end of her story is one of the things that's going to surprise the fans, too, where that all ends up." "Prax has this little line that goes through this that shows you part of the story that nobody else is seeing and informs the part of the war and the connections in it that no one person has their eyes on all the time," Abraham said. "That's something that came up several times in the book, the way that people have effects on each other and never know, never get to find out what the effect of their work was." Unlike Prax, Holden has taken a very active role throughout the series, leaking information and trying to effect change across the solar system. And he keeps doing that, but takes a … subtler tack. "In the first book, [Holden] was all about, 'Give people the information and let them make their decisions. They'll make the right decisions, because people are basically good,'" Abraham said. "We've been tearing him down and complicating him and having him grow more and more morally — not even gray, but baroque. He comes to this one with the idea that, yes, you just tell people what they need to know, and they'll make the right decisions. He hasn't changed his opinion on that. But the idea of what it is they need to know has changed radically." Throughout the story, readers will see Holden try to communicate what it's like in distant parts of the solar system during the everyday times, rather than solely during crisis, to try and create human connections among the different populations. "We wrote all of this before the election, so it wasn't even pointed," Abraham said. When asked what they're looking forward to sharing with readers in the long term, both authors said "the ending." The series will ultimately span nine books, and so the creators are nearing the home stretch and have to plot carefully to make sure everything leads up to a final, planned moment. "We always talk about this series in terms of spanning the time between late Apollo 13 and early Buck Rogers, and we're now edging into the parts of science fiction that are more exotic and more science fictional and wilder," Abraham said. "Everything we have been promising since the first book, and we set up in the third book, and we pushed forward in the fifth book, and we created the structures for in the sixth book, they're all the things we need to have in place to draw the story to a close in books seven, eight and nine," Abraham added. "Everything we built has been pointing towards a moment at the end of book nine — and I'm looking forward to having all the dominoes that we've set up do their thing."